This French Chicken recipe is only made up of 4 ingredients, making it one of my easiest go-to recipes! 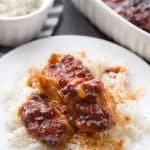 It can be made in the oven, Crockpot and Instant Pot! 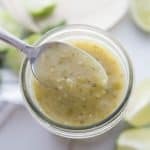 This Cilantro Lime Enchilada Sauce is full of flavor and will help result in some tasty homemade Enchiladas! Glorified Taco Bowls are a family favorite dinner. 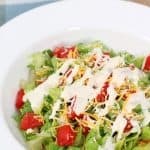 This layered taco bowl contains Chili Cheese Fritos, a tangy hamburger mixture, lettuce, cheese tomatoes and more! 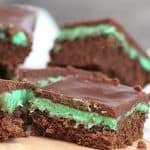 These Fudge and Mint Brownies are beyond delicious! 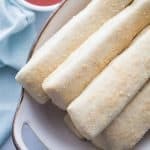 They’re rich, moist and full of flavor! We enjoy them year around, but always for St. Patrick’s Day! 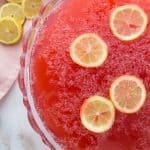 This delicious and sweet Pink Lemonade Sparkling Fruit Punch recipe is perfect for family gatherings, parties, baby showers and more! 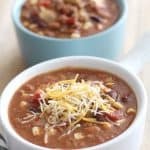 This Mexican Taco Soup has amazing flavors and can be made on the stove top or in the crockpot! It’s perfect for potlucks or to just serve to your family on a cold night! 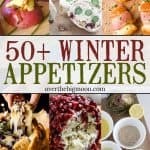 These 50+ Winter Appetizer Ideas that are perfect to serve during those cold Winter months for parties or family dinners! 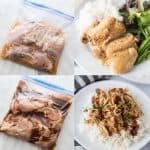 Seven simple recipes for you to make 14 Super Fast Chicken Freezer Meals that are both family friendly, beyond delicious and can easily be put together in just 90 minutes! This sweet and salty Gooey Chex Mix is a delicious snack that is perfect for parties, family reunions and more! Once you start eating it, you just can’t stop! The entire family will love it!